Jakarta, Indonesia — U.S. Secretary of State Mike Pompeo has wrapped up his Southeast Asia tour. Before leaving Sunday to return to Washington, he met with Indonesian President Joko Widodo, telling him the U.S. values its ties with Indonesia, one of the world’s largest democracies. Saturday, the top U.S. diplomat met with his Indonesian counterpart Retno Marsudi. The secretary and the foreign minister discussed bilateral cooperation and multilateral engagement on regional security challenges, including North Korea and counterterrorism, as well as other foreign policy issues of mutual interest. Pompeo arrived in Jakarta Saturday from Singapore, where there were mixed messages on relations between the U.S. and North Korea amid talks over de-nuclearization. On the plane to Jakarta, State Department spokesperson Heather Nauert told reporters Pompeo and North Korean Foreign Minister Ri Yong Hu approached each other during the “family photo” session and shook hands. 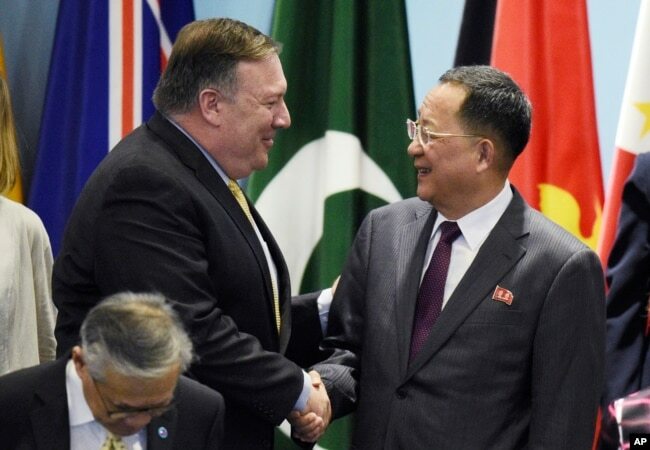 Pompeo said, “We should talk again soon,” to which North Korean Foreign Minister Ri Yong Hu responded, “I agree. There are many productive conversations to be had.” After that, U.S. Ambassador to the Philippines Sung Kim delivered to Ri a letter from President Donald Trump to North Korean leader Kim Jong Un. The contents of the letter were not disclosed. A senior U.S. administration official said the brief encounter between Pompeo and his North Korean counterpart was not surprising. “This is to be expected. Much of the intervention was positive and that’s an improvement from the past. We’re building a relationship with North Korea after years of difficult relations,” the official said. Pompeo left the annual summit of the Association of Southeast Asian Nations (ASEAN) to head to his final stop in Jakarta. After he left the room, North Korean Foreign Minister Ri delivered a statement saying his country is committed to adhering to the agreements made between Trump and Kim at the Singapore summit in June. But he called the U.S. attitude on urging other countries to keep up the sanctions on North Korea “alarming” and said it was not what Trump wants. Ri’s remarks followed the release of a United Nations report warning that North Korea has found ways to navigate around the sanctions. The report said North Korea has had a “massive increase” of illegal ship-to-ship transfers of oil products at sea to evade sanctions. The report also documented violations of a ban on North Korean exports, including coal, iron and seafood, all of which generate millions of dollars of revenue for Pyongyang. There also are indications the North is continuing to build rockets, and concerns the nation has not been clear about when and how it will disarm. Pompeo said the U.S. is taking any infringement of the sanctions very seriously. “We have seen reports that Russia is allowing for joint ventures with North Korean firms and granting new work permits to North Korean guest workers,” Pompeo said. “If these reports are proven accurate, and we have every reason to believe that they are, that would be in violation of U.N. sanctions,” he said. Friday, the U.S. Treasury Department said it imposed sanctions on a Russian bank for helping North Korea avoid U.N. Security Council actions intended to restrain Pyongyang’s nuclear weapons and ballistic missile programs. The agency said Moscow-based Agrosoyuz Commercial Bank expedited “a significant transaction” with an individual who the U.S. blacklisted for being involved in North Korea’s weapons development programs. Treasury said the Russian bank conducted the transaction for Han Jang Su, the Moscow-based head of North Korea’s Foreign Trade Bank (FTB), Pyongyang’s primary foreign exchange bank. Han’s deputy, Ri Jong Won, who also is based in Moscow, also was targeted by the sanctions. The department said both Han and Ri should be expelled from Russia under U.N. resolutions designed to pressure North Korea for its weapons programs. And Treasury targeted what it said were two FTB front companies, China-based Dandong Zhongsheng Industry & Trade Co. Ltd. and Korea Ungum Corporation. Before leaving the ASEAN summit in Singapore, Pompeo met with Myanmar Foreign Minister Kyaw Tin and called for the immediate release of two Reuters journalists detained in the Southeast Asian country. State Department spokesperson Nauert told VOA that Pompeo raised the issue during a sideline meeting and added that the U.S. is very concerned about their detention. The journalists were charged with possessing documents linked to security operations against Rohingya militants in Myanmar’s northern Rakhine state. Additionally, Pompeo also met Saturday with South Korean Foreign Minister Kang Kyung-wha, Japanese Foreign Minister Taro Kono and Australian Foreign Minister Julie Bishop. He signed a memorandum of understanding with Singapore’s Foreign Minister Vivian Balakrishnan for the U.S.-Singapore Third Country Training Program, which supports community-building efforts among the 10 ASEAN member states. 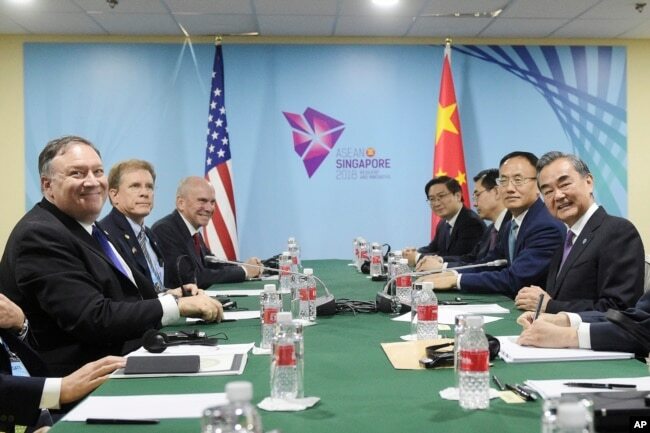 Pompeo met Friday with Chinese State Councilor and Foreign Minister Wang Yi in Singapore. The two men did not speak to the press after the meeting, but shortly thereafter China warned it would impose new tariffs on $60 billion worth of U.S. goods if the Trump administration follows through with its latest trade threats. The Commerce Ministry said the proposed tariffs of 5 percent to 25 percent on more than 5,200 U.S. goods are restrained, and maintained it has the right to take retaliatory action in the escalating trade war between the world’s two largest economies. On Thursday, the Chinese Foreign Minister told reporters the U.S. needed to calm down and consider its own consumers, responding to threats by the Trump administration to raise its proposed tariffs on $200 billion worth of Chinese goods from the initially planned 10 percent to 25 percent. The U.S. says it wants China to stop stealing U.S. corporate secrets and stop subsidizing Chinese companies with cheap loans that give them an unfair advantage.